Fyvie is a small village in the region of Buchan, in Aberdeenshire, Scotland. It lies alongside the River Ythan. Fyvie is host to Fyvie Castle reputed to be home to some of the ancient Scottish kings. The earliest parts of Fyvie Castle date from the 13th century - some sources claim it was built in 1211 by William the Lion. 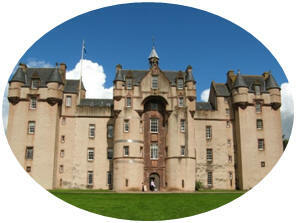 Fyvie was the site of an open-air court held by Robert the Bruce, and Charles I lived there as a child. Following the Battle of Otterburn in 1390, it ceased to be a royal stronghold and instead fell into the possession of five successive families - Preston, Meldrum, Seton, Gordon and Leith - each of whom added a new tower to the castle. The castle (like many Scottish castles) is said to be haunted. A story is told that in 1920 during renovation work the skeleton of a woman was discovered behind a bedroom wall. On the day the remains were laid to rest in Fyvie cemetery, the castle residents started to be plagued by strange noises and unexplained happenings. Fearing he had offended the dead woman, the Laird of the castle had the skeleton exhumed and replaced behind the bedroom wall, at which the haunting ceased.